Well, ok, that happened a little while ago. September 12 to be exact. But I'm still trying to work through all the layers associated with being back. A big one is how different it is when you are temporarily living in apartments with only one luggage + one backpack per person. All at once we were back in a full-fledged house and our meager baggage went to 5 pieces of luggage + 5 backpacks + 1 more piece of luggage + 2 carry-ons + 3-18 gallon storage bins + a bunch of extra things. Then once arriving at the Georgia House (I do need to come up with a different name, since it is the only house now), we have a two story house filled with everything that Big Grandma wanted, needed, collected or hoarded PLUS everything from our house in New Jersey. My simple mind is having trouble holding all of this in. Actually it's the side of me that has to have everything in its proper place that is going fritzy. I liked the simplicity of our travels. But I am also fortunate to have this wonderful house to live in, filled with almost anything anyone could ever want (usually three of everything, unless it is rubber bands - then there isn't a limit). And I have the time to be able to go through it, box by box by cabinet by closet by room by workshop by basement, to finally see the floor and make a path to the door so I can go out and see the sun. No cruise (all ready did it), no cuisine (already ate), no carpet (no really, I don't need a carpet!). 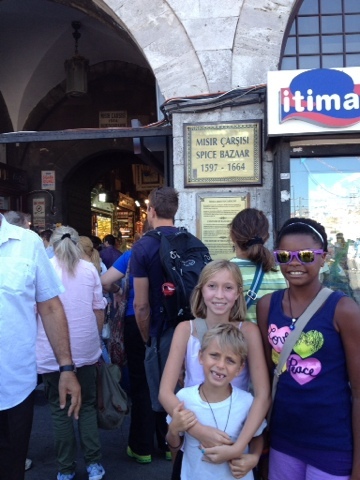 Courtney and I repeat these 3Cs over and over again each time we walk out and about in historic Istanbul. But once we make it past the accosting areas you can really enjoy the city. 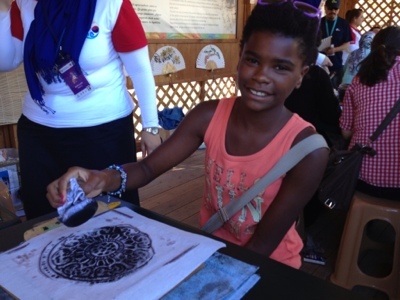 Imagine our delight after stumbling onto the World Culture Expo! 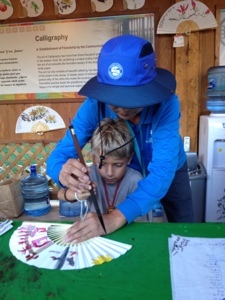 It's not the same as being there - but we are experiencing the culture of over 50 nations all while staying in the same city. And guess what? Our "I'm never going to travel again" and "How could you sell MY house" young lady has been researching tickets to South Korea. Quite a surprise. 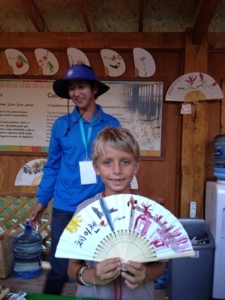 Until you realize that she is captivated by the different clothes and dances of Asia. This has even sparked a new career choice. We are moving away from being a model and singer to a ... 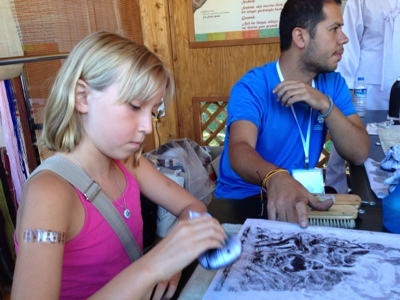 Cultural Anthropologist. Whoo-hoo! So now we will have an archeologist, a cultural anthropologist and a .... break dancer/police person/chiropractor. 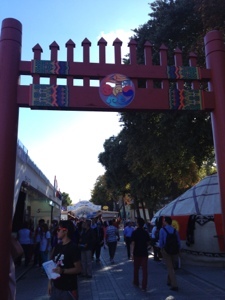 But back to the Expo. 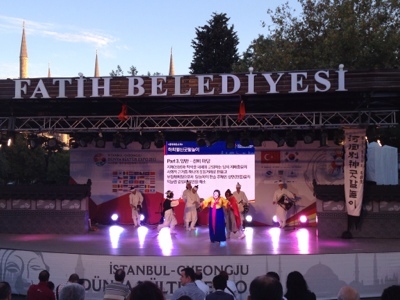 We have been able to do traditional crafts, look at traditional crafts, view scenic photos, watch performances and dances, all without leaving Istanbul. Our hotel is amazing! 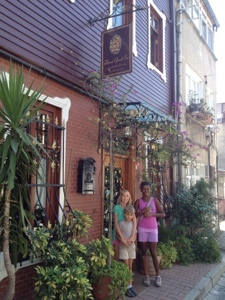 We are staying at the Ahnet Efendi Evi Biutique Hotel in the Fendi Municipality of Istanbul. 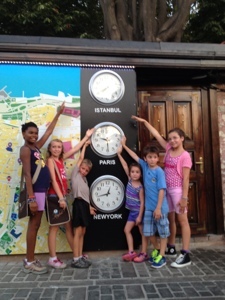 We are minutes from all the major sights in the old town. Thank you Hakan for hooking us up! Staying in a hotel is an experience that we are still getting used too. 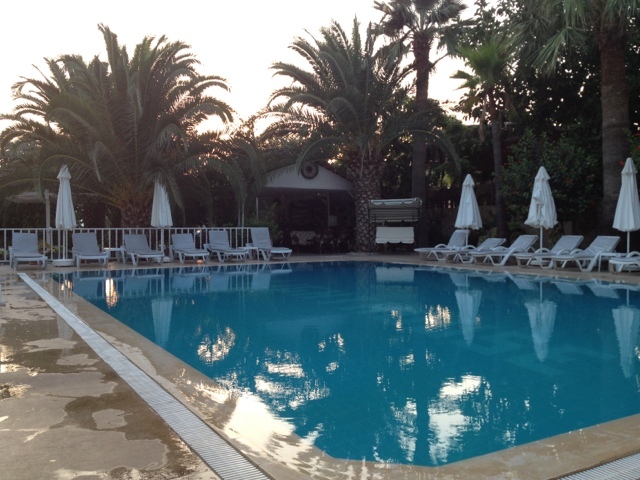 Up until our stay in Patara, Turkey, we had only spent two nights in a true hotel (one night in Venice, one night in Rome; unless you count the Landhaus Panarama - but we had a kitchen there, and Gerda!). 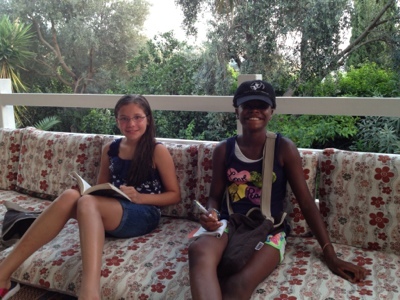 On our adventure our accommodations have been apartments with kitchen facilities. 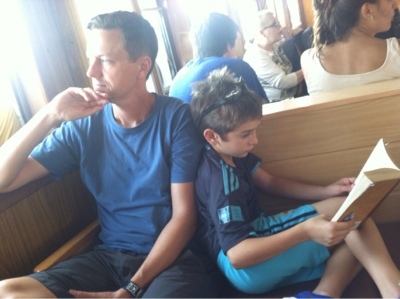 Which is a great way to travel! It has revolutionized the way Courtney and I think of taking a vacation. In the future, I think we will be finding more apartments on homeaway.com, VRBO.com, Flipkey.com, Tripadvisor.com, plus local ones like Livelikeagerman.com instead of planning hotel-stay vacations. Being able to cook and store your own food has been invaluable on this trip. Not only has it helped the budget, but it helps the hungries, too. 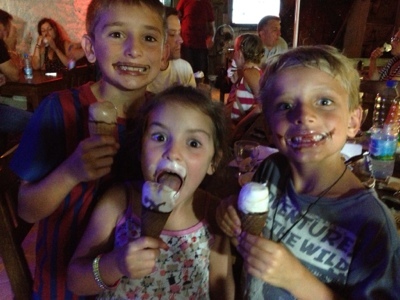 It seems that our children eat - a lot! And it helps to have a refrigerator full of cucumbers, carrots, yogurt, etc. to bust out when a snack is required. We also love filling up ziplock bags (or inexpensive plastic containers bought at the Euro Store) with veggie/fruit/ nuts to take with us. 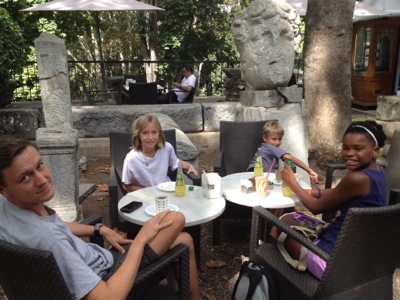 Waiting in a L O N G line at an antiquity is bound to get someone's stomach growling. 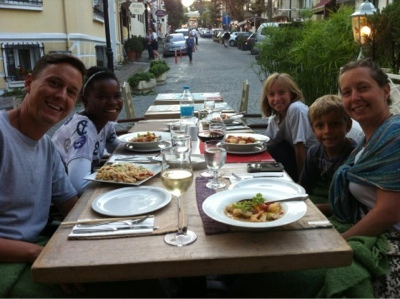 On the plus side, the food is delicious in Turkey and so are the prices - if you know where to look. 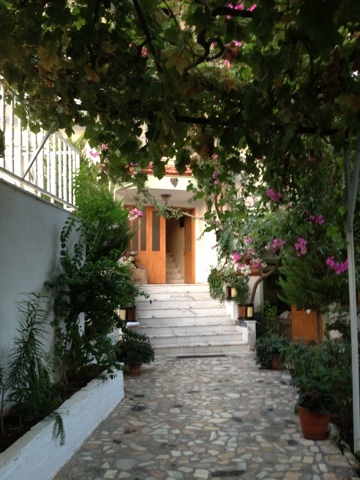 In the city municipality where we a staying there are six government-owned restaurants. Which means good Turkish food at a great price. We've found three of them. 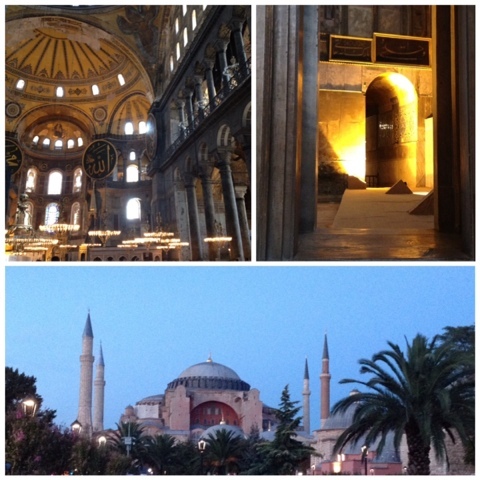 Our favorite one is close to Hagia Sofia and the Sultanahmet Mosque - Fatih Belediyesi Sultanhamet Sosyal Tesisleri. The food is basically the same at all three, but the service at this one rocks! Well actually, one person in particular. 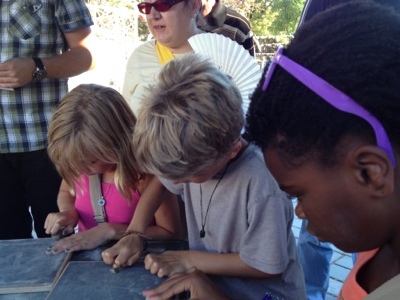 Isn't it amazing how it only takes one person to make (or break) the experience? Of course it probably helps that Chayton offered to do the dishes (he loves to wash dishes). Unfortunately, they have actual dishwashers, but our maître d loved the offer and it has become a running joke. 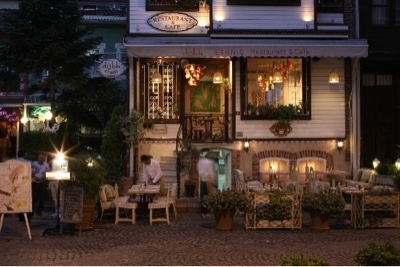 Our next favorite Fatih Belediyesi restaurant sits on the edge of the Sea of Marmar. Can you imagine? A reasonable priced restaurant at a prime water location? At this one I think they were a little surprised to have American tourists. 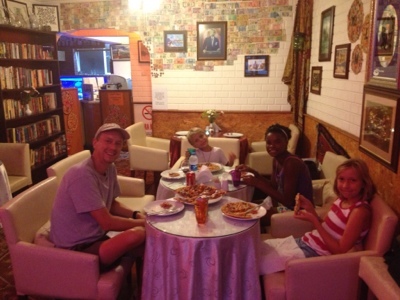 Of course, the hospitality at Ozi's and at Dubb Indian Restaurant takes the cake. 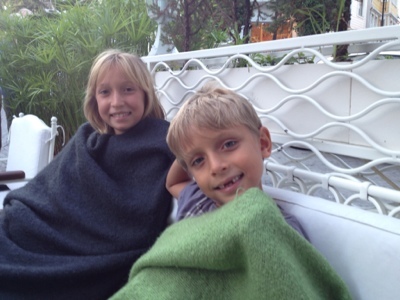 The service at Dubb even included blankets to ward off the cool night breeze. Not to mention all the yummy street-side cafes and stands where you can get a chicken doner sandwich and a drink for about 3 US dollars. Yum. And wow. 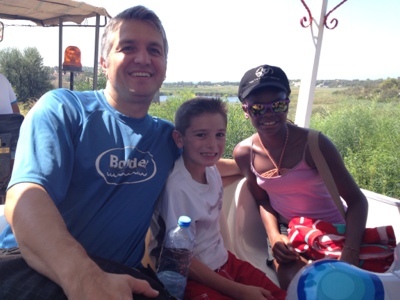 What an amazing vacation with the extended Vural family in Patara! 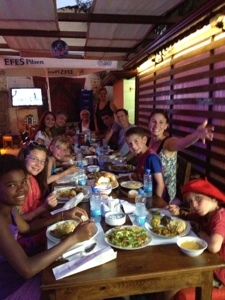 Our travel group included: the five Allen's, the five Vural's, Hatice - Hakan's mother, Sema - Hakan's older sister, Emir and Seyda - Sema's children, and Seda - Hakan's younger sister. 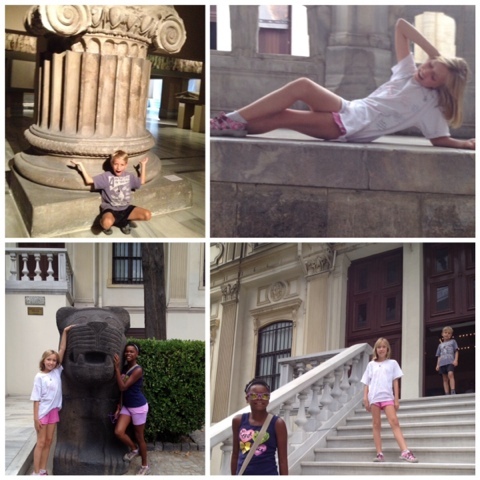 We caught our Pegasus flight (airlines that is - our Percy Jackson loving family got a kick out that) and headed from Istanbul to Dalamon. From there it was supposed to be an hour and a half ride to Patara. 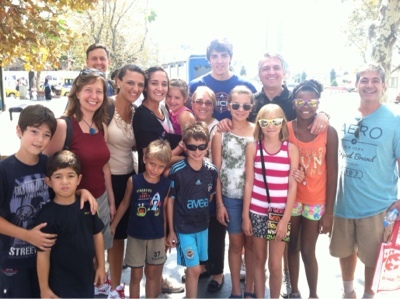 It seems the Vural's travel like the Allen's ... I don't even remember how long it actually took us ... super market stop, restaurant stop, bathroom stop. But we finally made it to our little hotel. The first night we stayed in a smaller pension, but the next day we moved into the Golden Lighthouse for the rest of our stay. It was such an experience spending time here in a very simple, comfortable and welcoming place - not only our hotel, but the village as well. And now it was all about eating, beach, eating, pool, gift-shopping, eating ... you get the picture. 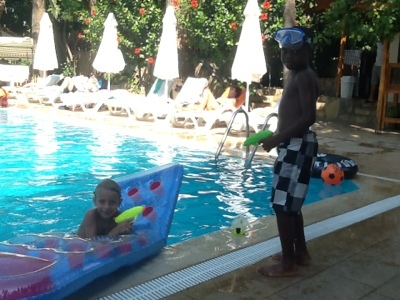 Everything was taken care of for us - we were spoiled! 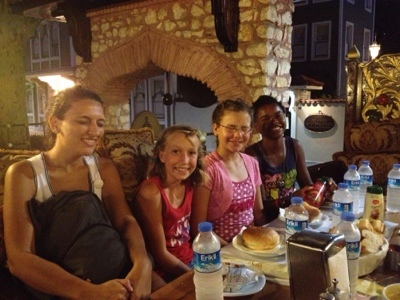 Hatice made friends with all the ladies in the small village and found the best place for us to eat (It seems that the Turkish world goes around by who you know and what kind of deal you can make. 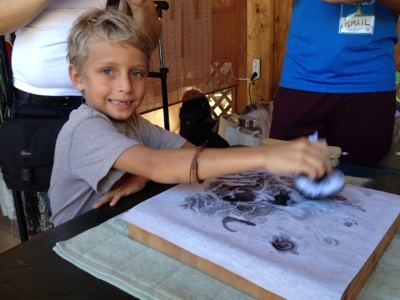 Hakan and his family are masters at this skill). The first few nights we ate at a restaurant just a little ways down the hill from the Golden Lighthouse. Yummy! Soup, salad, main course and tea. 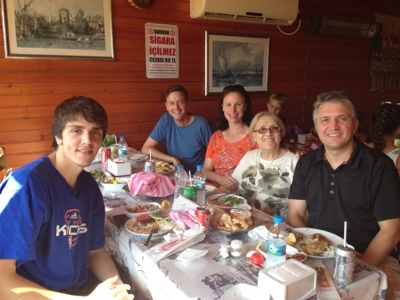 All of the Allen's have tried and liked so many new Turkish dishes. 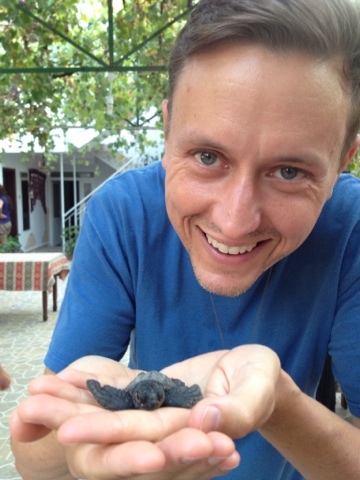 A special extra at this restaurant is that a turtle scientist (like my official title?) is staying there. He is watching over the leatherback turtles as they lay eggs at Patara Beach. 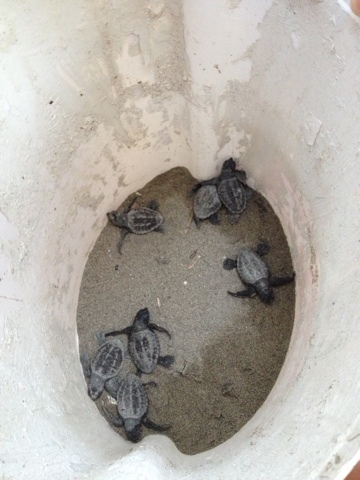 Each morning he goes out to check on the turtle eggs and see how they hatch. 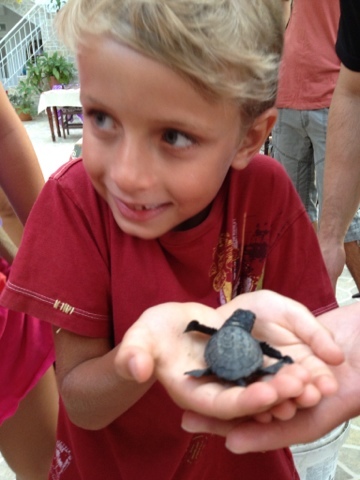 If he finds a few turtles that are stuck in their eggs he will bring them back to the pension to help the turtles hatch. 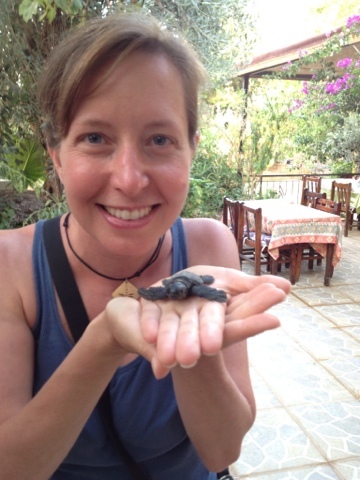 What this long explanation means is that we were able to hold baby turtles! 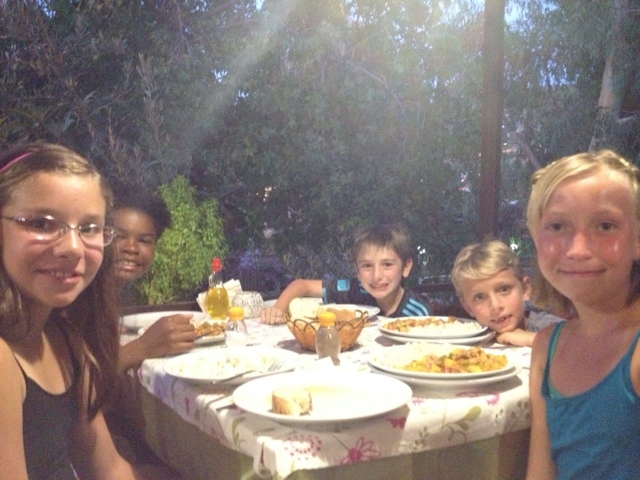 Hatice soon found us another wonderful spot to eat dinner that was down in the village. The food was just amazing. 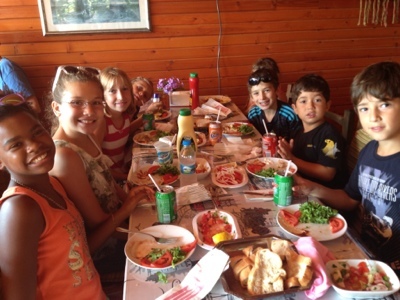 A whole host of traditional Turkish cuisine. But, we still got our lunch from the first restaurant - yummy gozleme. Unfortunatly, Courtney got a stomach bug and was out of commission for the first few days that we were there. Not fun. So the rest of us took the shuttle to the beach, enjoyed the pool or hung out on the reading terrace and the "hammy sacks" as dubbed by Nazeriah (otherwise called hammocks). 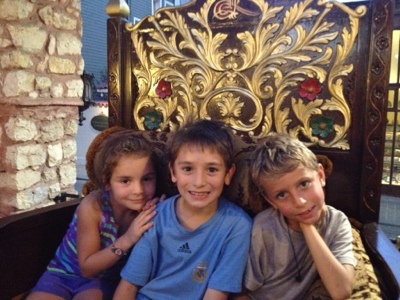 One of Chayton's new friends - Zack from London. The only other blip on our vacation time was Kaija's reaction to the sun, salt, water, chlorine, sunscreen or something else - maybe even all of the above. So she had to spend some time out of the sun and water while the swelling and redness left her face. 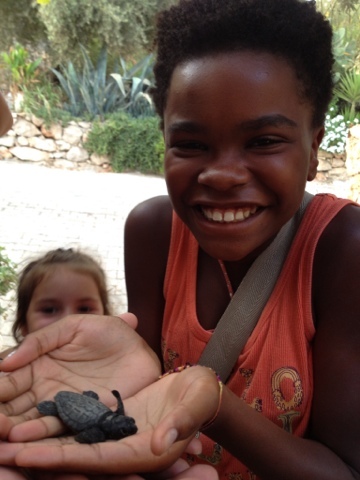 A huge thank you to friends of the Vurals who came to visit us in Patara. 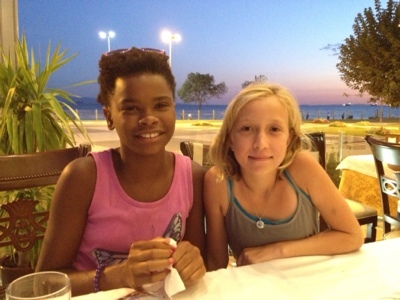 One of them had a very bad sunburn in the past and the doctor told her to use Silverdin (a burn cream). 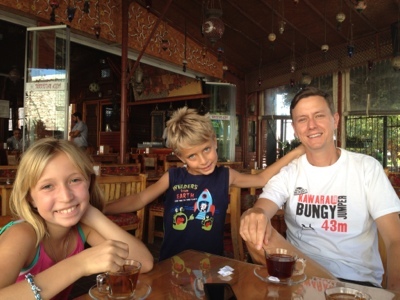 Hakan, Babaanne and their friend scoured our little village of Patara to find this cream for us. Even driving to the town over to the actual pharmacy to pick it up for us! Not only did they get that, but also some lidocaine cream for the pain. These were a miracle. Not only did it help the swelling go down, but the redness disappeared and it saved her skin - no pealing! This in just a matter of days. We were all relived and happy with this outcome, especially Kaija! 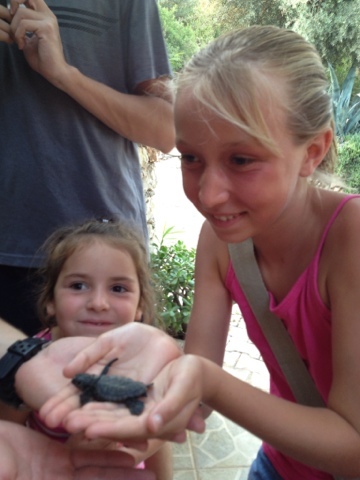 Sadly, all things do come to and end and we had to say goodbye to Patara and travel back to Istanbul. 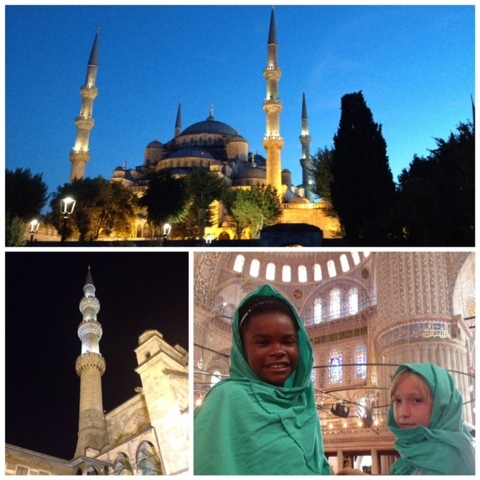 We've made it to Istanbul! Along with our long-awaited reunion with the Vurals! Happy Days! On Saturday night Hakan and Emir collected us from the airport and drove us to Seda and Harun's apartment. 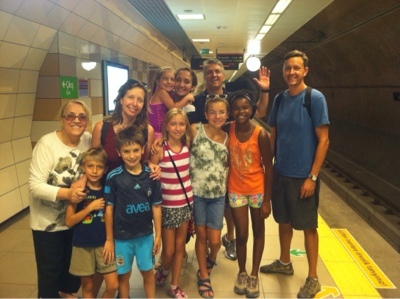 We are so grateful - Seda and Harun have turned their apartment completely over to our family and the Vural's (here after named as the VurAllen's). They are staying at Harun's mother's apartment while we kicked them out. Finally at last - all the Vural's (plus the extended Vural's) and the Allen's were all together again after six long months apart. It was a glorious reunion and a delicious welcome-back dinner made by Hatice, Sema and Seda. 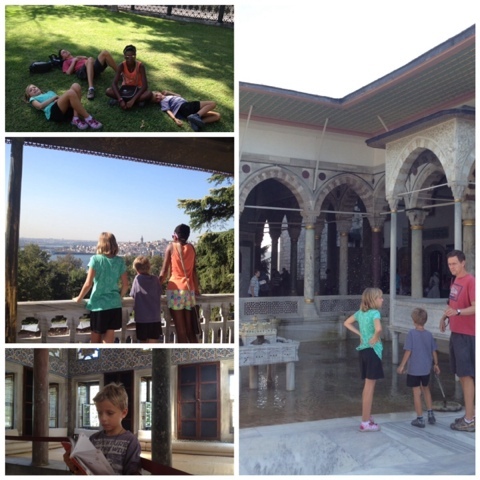 On Sunday our group of fourteen headed out to explore Istanbul which included our tour guide extrodonaire - Seda. 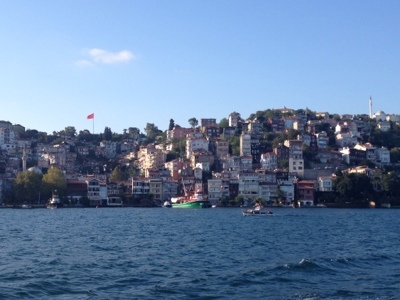 First up - cruise on the Bosporus and journey to the Asian side of Turkey. 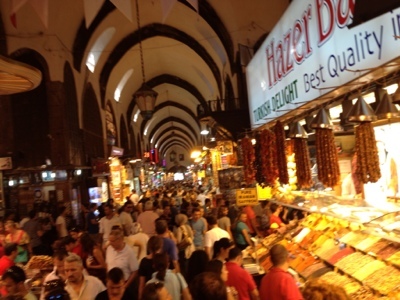 Did you know that Turkey spans both the European and the Asian continents, divided by the Bosporus? 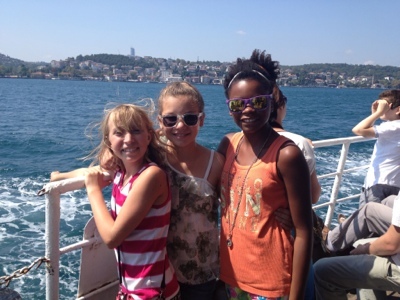 We walked to the Metro to get to Kadiköy and a short ferry ride to get us to Besıktas, where we got on the big ferry for our cruise. 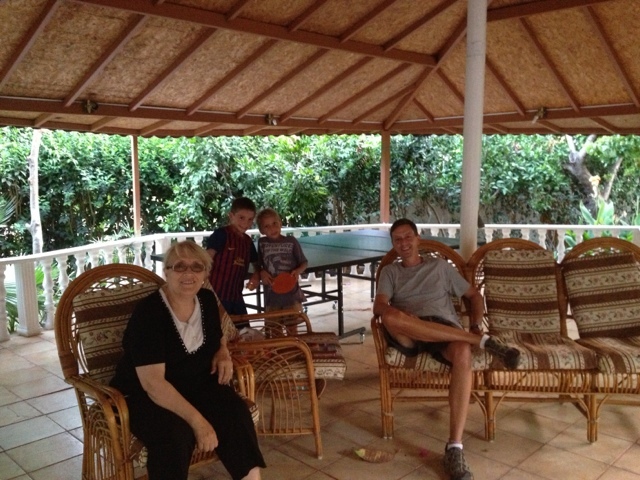 Here we met our new friends Ozer and his sons Umut and Mert. 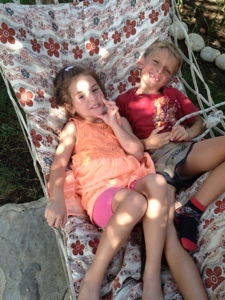 As well as welcoming back Seyda and Emir. Our group turned into a herd. 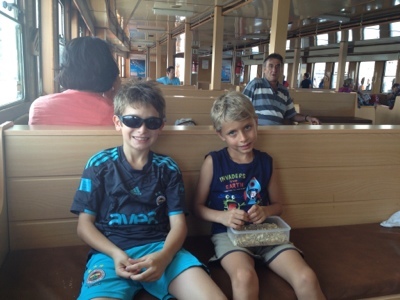 Our ferry started out close to the Sea of Marmara and by the afternoon we were at the mouth of the Black Sea. 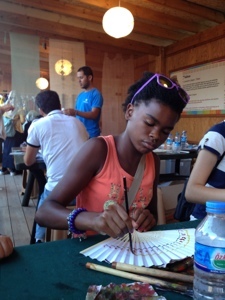 What a great way to get to know Istanbul. It was beautiful cruising along with the fresh breeze and watching the scenery go by. 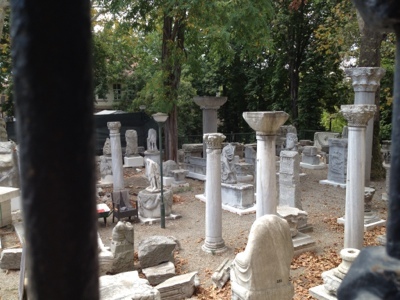 Our destination was Anadolu Kavağı where we hopped off and started wandering the streets. 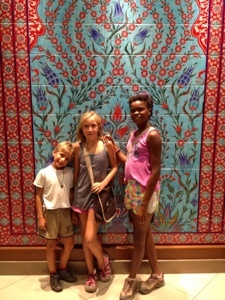 Seda and Seyda went off to search and bargain for the best place for our herd to eat lunch - and did they find a great place! Air conditioning and our own little room on the second floor of the restaurant. 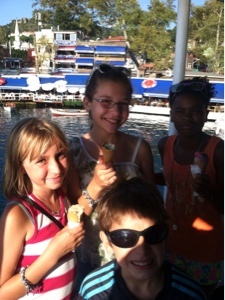 After lunch it was time to hit the shops and ice cream! 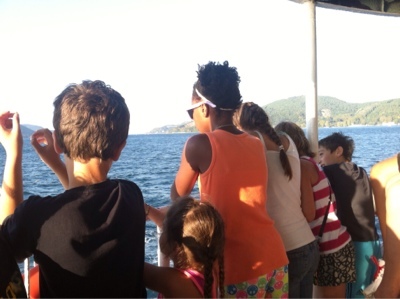 Then it was time to head back on the 6:00pm boat. By the time the boat docked it was time to eat again! Dinner in Kadikoy was yummy Durum which is like a Turkish burrito in a very thin tortilla filled with shaved meat. Finally we headed home - tired and well-fed. 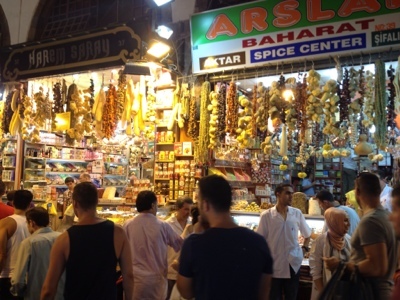 Monday it was time to explore the Spice Bazaar otherwise known as the Egyptian Bazaar with our tour guide Seyda. 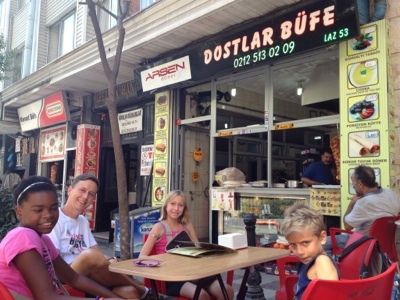 By the time we left the apartment and took the Metro to Kadikoy it was time for lunch - more Durum. Yum. 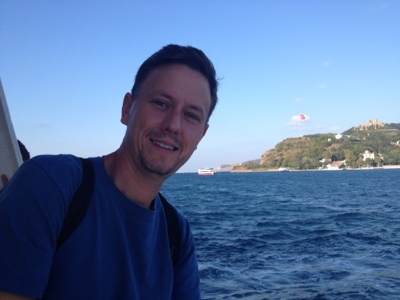 Another ferry ride to Emınönü where we saw the Aya Sofia, the Blue Mosque, Topkapi Palace and the old city walls in the distance. 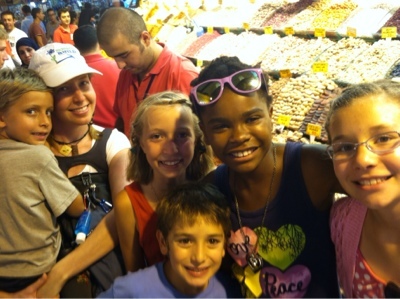 The Egyptian Bazaar was everything I had hoped it to be - but also very, very crowded! 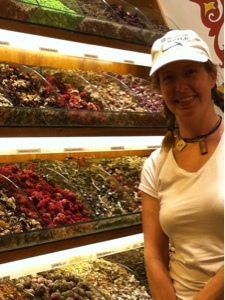 I loved seeing and smelling the open bins of spices and tea; I think the smell of the pomegranate tea is my favorite. 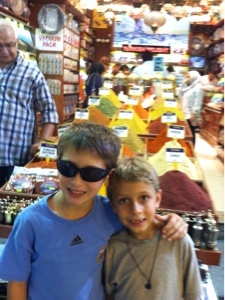 Of course we had to sample some Turkish Delight (Lokum). After shopping indoors and outdoors (a little less crowded), we were hot and hungry. Since it was rush hour, there was no way we'd make it home in any reasonable time. So onto the light rail to Aya Sofia and the Blue Mosque. 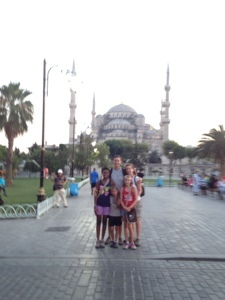 How many of you can say you've played a game of freeze tag between the Aya Sofia and the Blue Mosque? I can! 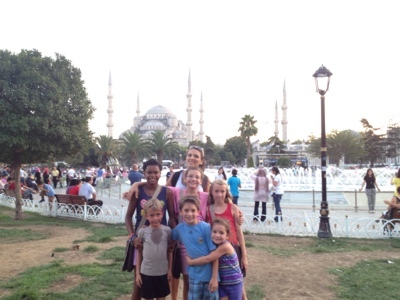 It was quite the game - six kids and three adults while Seyda was kind enough to hold all of our bags. Then it was time to eat again, of course. 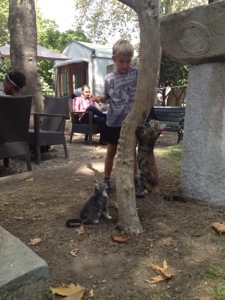 The Vural's took us to their favorite outdoor cafe behind the Aya Sofia - the Dervish. And guess what? 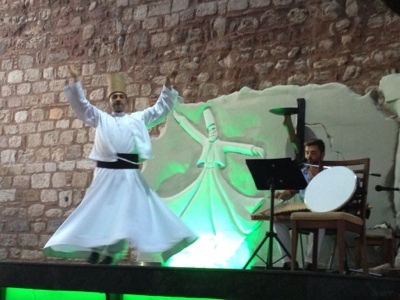 There was a whirling Dervish performing while we ate. After a scrumptious dinner it was time to head home - very late - for a little bit of sleep. 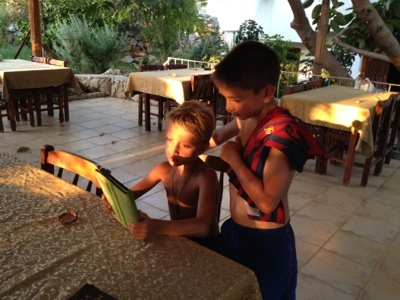 We had to catch a plane in the morning to take us to Dalaman and our Patara beach vacation.